This fish mousse uses guidelines from Garde Manger, and the puff pastry is adapted from The Complete Robuchon (the original doesn’t use buckwheat flour, of course). You might want to serve some bread on the side as well. Obviously, you don’t have to use yellow perch; many other white fish, such as cod or sole, would work very well. Finally, note that whipped cream is used in 2 places, so you could whip all the cream together, and then weigh the amount for each application. Char the eggplants with a gas flame (either a blow torch or your stovetop) until black on all sides. Transfer to an oven dish, cover with foil, then bake in 350 F oven until tender (their internal temperature should reach 190 F / 88 C). Let cool for a few minutes. Peel the eggplants, and chop the flesh — I had about 500 g of flesh at this point. Transfer to a saucepan, add the olive oil, salt, and pepper, and heat for a couple minutes until hot, stirring constantly. Transfer to a blender, add the lemon juice, and process until smooth. While blending on low speed, add the gelatine, then whiz on high speed for a few seconds. Pour into a 11.5 cm x 23 cm dish lined with plastic wrap, cover with more plastic wrap, and refrigerate for at least 4 hours. Place the egg yolk, mustard, salt, lemon juice, and water in a bowl, and mix with a whisk. Slowly pour the oil in a thin stream while whisking. You can check out how Jamie Oliver does it on YouTube. If the mixture gets soupy, congratulations, the mayonnaise has broken and you need to start over! Season the yellow perch fillets, both small and large, with the smoked salt. Place in two separate sous-vide pouches with half of the butter in each pouch. Cook in a 120 F water bath for 20 minutes. Bring the stock to a bare simmer in a small saucepan. Transfer the stock to a blender, and add the horseradish and Worcestershire sauce. Start blending on low speed, add the gelatine, then whiz on high speed for a few seconds. Add the small fish fillets and their cooking liquid to the blender, and process until smooth. Transfer to a bowl, cover, and let cool until the mixture is just about to set. Mix in the mayonnaise and lemon juice. Whip the heavy cream to soft peaks, then fold it into the fish mixture. Take the large fish fillets out of their pouch, and arrange them at the bottom of a 9 cm x 20 cm dish lined with plastic wrap. You can use a bit of the fish mousse to bind the fillets together if needed. Pour the fish mousse over the large fillets, cover with plastic wrap, and refrigerate for at least 4 hours. Melt 1/3 of the butter in the microwave, then mix in the salt and the water. In the bowl of an electric mixer fit with the paddle attachment, add the butter mixture, buckwheat flour, and bread flour. Mix on low speed long enough to make a ball, then knead by hand for a minute. Cover with plastic wrap, and refrigerate for 30 minutes. Place the rest of the butter between two sheets of plastic wrap, and roll to a 1 cm thick square. Dust your work surface with flour, and roll the dough into a square large enough to encase the butter. Place the butter in the center, and fold the corners over like an envelope (the kind with the four triangular flaps, not the adhesive type!). Use the rolling pin to seal the seams. Roll the dough lengthwise until its surface area has tripled. Fold into thirds by folding each edge over the middle. That’s the first turn. Give the dough a quarter turn clockwise, and repeat the previous step. That’s the second turn. Refrigerate for at least 45 minutes. Dust your work surface with flour, and roll the dough to a 1/2 cm thick rectangle. Cut into pieces of various shapes, such as 1.5 cm x 6 cm rectangles, 3 cm x 3 cm squares, and 3 cm diameter discs. Space the pieces out on a baking sheet lined with parchment paper, and bake in a 225 C / 450 F oven for 15-17 minutes, until cooked through. Transfer to a cooling rack, and reserve. Add the lemon juice, dill, and salt, and whip to firm peaks. Transfer to a piping bag fit with a decorative tip, and refrigerate. Take the eggplant caviar out of its dish, and cut into 18 squares or rectangles. Sprinkle with parsley on all sides. 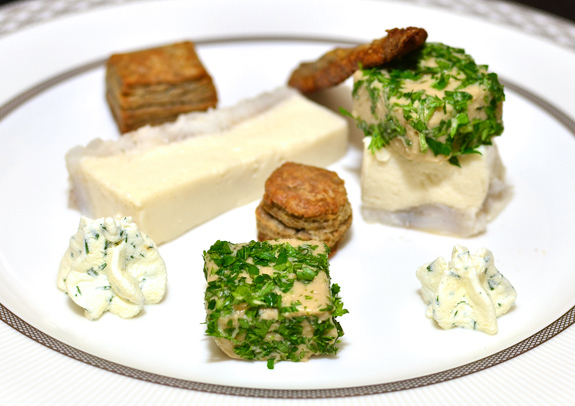 Take the fish mousse out of its dish, and cut into 18 slices, or 9 slices and 9 cubes. 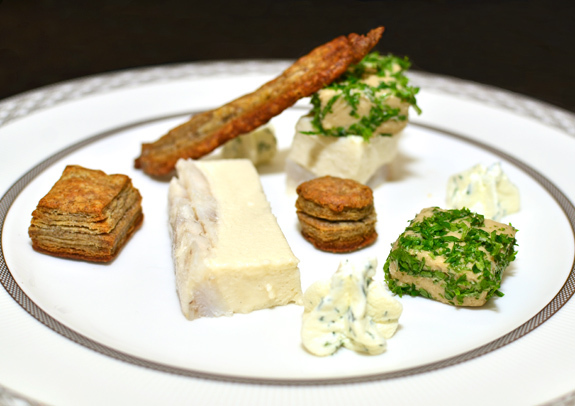 Arrange the pieces of eggplant caviar and fish mousse on the plates, together with the puff pastry shapes. Pipe a few rosettes or other decorative shapes with the dill whipped cream, and serve.